Maca Root is a nutritionally dense super-food that contains high amounts of minerals, vitamins, enzymes and all of the essential amino acids. It is rich in B-vitamins, which are the energy vitamins, and is a vegetarian source of B-12. Maca is rich in bioavailable dietary minerals calcium and potassium (with low content of sodium), and contains the essential trace elements iron, iodine, copper, manganese, and zinc as well as fatty acids including linolenic acid, palmitic acid, and oleic acids, and 19 amino acids. Maca is used for enhancing energy, stamina, athletic performance and memory. It has been said to help balance our hormones and due to an overabundance of environmental estrogens, most people’s hormones are a bit out of whack. Maca stimulates and nourishes the hypothalamus and pituitary glands which are the “master glands” of the body. These glands actually regulate the other glands, so when in balance they can bring balance to the adrenal, thyroid, pancreas, ovarian and testicular glands. Instead of providing hormones to the body, maca works as an adaptogen which means that it responds to different bodies’ needs individually. If you’re producing too much of a particular hormone, maca will help regulate the production downward. However, if you’re producing too little, it’ll regulate the production upward. Hormones regulate many things in the body including mood, growth, sexual development, and tissue function. Hormones also play a role in many diseases, like cancer and depression. Maca root has been shown to be beneficial for all sorts of hormonal problems including PMS, menopause, and hot flashes. It has been reported to have aphrodisiac properties, be a fertility enhancer and is best known for improving libido and sexual function in men and women. Maca is an exceptionally hardy root plant native to the Andean mountain plateaus of Peru. 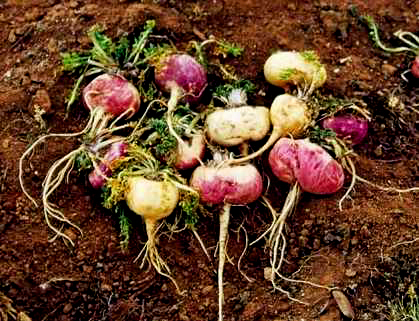 A member of the brassica family, maca is grown at altitudes of 14,000 feet in poor volcanic soil and an extreme climate of freezing cold, fierce winds and intense sunlight, where no other crops can survive. Herbalists believe that resilient plants are especially valuable; from an herbological perspective, maca’s resiliency knows no equal. Ancient, native Peruvians used maca for thousands of years as both a food and a tonic. They believed maca increased energy and stamina, improved fertility and enhanced libido. Maca hypocotyls may be gold or cream, red, purple, blue, black, or green. Each is considered a genetically unique variety, as seeds of the parent plants grow to have roots of the same color. Recently, specific phenotypes (in maca, ‘phenotype’ pertains mainly to root color) have been propagated exclusively to ascertain their different nutritional and therapeutic properties. Cream coloured roots are the most widely grown and are favoured in Peru for their enhanced sweetness and size. 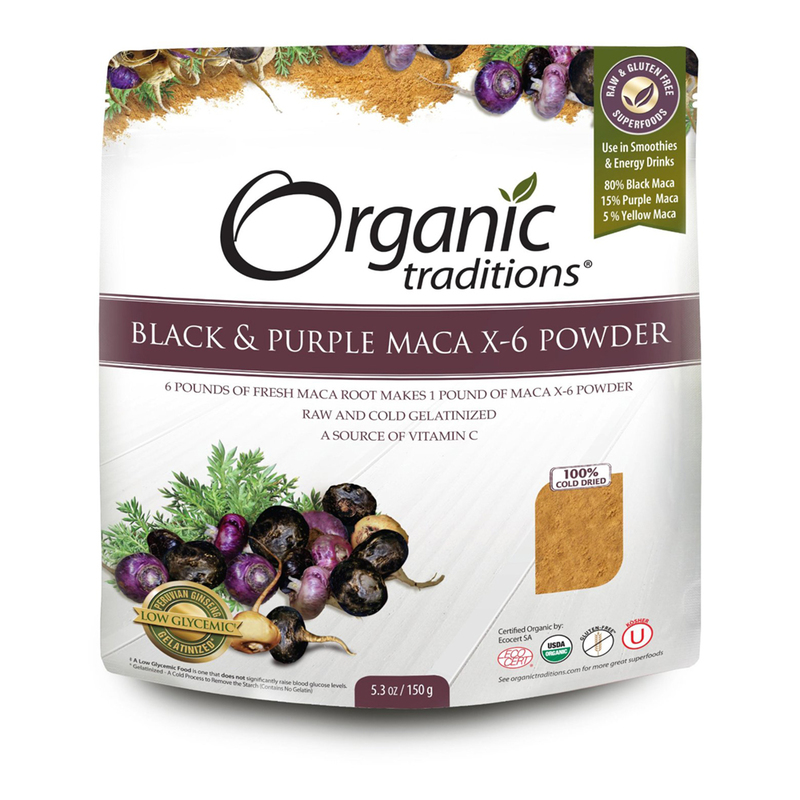 Darker coloured maca roots (red, purple, black) contain significant amounts of natural iodine that may avoid the growth of goiters resulting from consumption of the lighter coloured maca. Black maca is considered the strongest in energy and stamina-promoting properties, being both sweet and slightly bitter in taste. Red maca is becoming popular with many people, and has been clinically shown to reduce prostate size in rats. The nutritional value of dried maca root is high, similar to cereal grains such as rice and wheat. The average composition is 60-75% carbohydrates, 10-14% protein, 8.5% dietary fiber, and 2.2% fats. 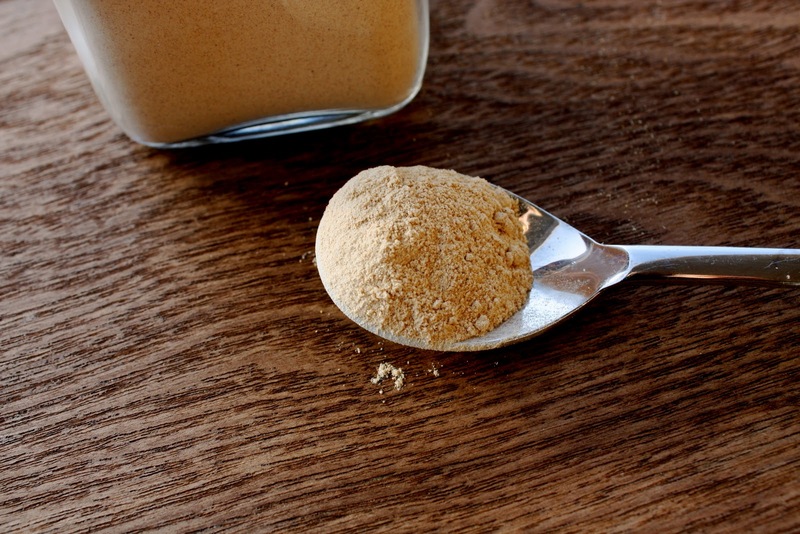 In addition to sugars and proteins, maca contains uridine, malic acid, and its benzoyl derivative. Buy only certified organic Maca Root and read the label – high protein count is a great indicator of optimal growing conditions and careful processing. Maca root is a food, for it to be effective and to achieve results, proper dosages should be followed. In keeping with original ancestral Peruvian dosages, you should mix 3/4 to 1 teaspoon of Maca into smoothies, yogurt, herbal teas, fruit juices, etc. Or if you are using our MACA POWER& Vegetarian Capsules take 2 to 6 500mg Capsules per day or as directed by your health practitioner. It is best store Maca Root Powder in dark dry cupboard. Some people store it in the refrigerator but this is not necessary but some feel it keeps the powder fresh and the consistency lighter. 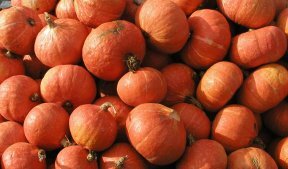 The winter squash group includes pumpkin, acorn, butternut, spaghetti squash, ambercup, buttercup, hubbard, kabocha, banana, carnival, sweet dumpling, golden nugget, autumn cup…ect. Winter squash, like other richly colored vegetables, provide an excellent source of carotenes. Generally, the richer the color, the richer the concentration. They also offer a very good source of vitamins B1 and C, folic acid, pantothenic acid, fiber, and potassium. 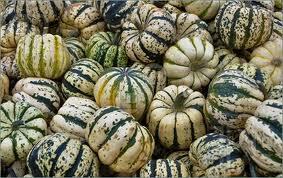 Winter squash are also a good source of vitamin B6 and niacin. Studies have shown that, due to their carotene properties, winter squash exert a protective effect against many cancers, particularly lung cancer. Diets that are rich in carotenes (especially pumpkins) offer protection against cancer, heart disease, and type 2 diabetes. Studies have also shown that pumpkin seeds are helpful in reducing symptoms of benign prostatic hyperplasia (BPH). We think about winter squash as a very starchy vegetable – about 90% of its total calories come from carbohydrate, and about half of this carbohydrate is starch-like in its composition. However, recent research has made it clear that all starch is not the same, and the starch content of winter squash brings along with it some key health benefits. Many of the carbs in winter starch come from polysaccharides found in the cell walls. 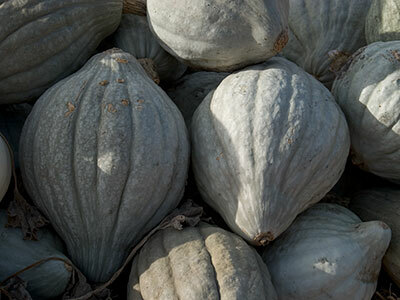 These polysaccharides include pectins – specially structured polysaccharides that in winter squash often include special chains of D-galacturonic acid called homogalacturonan. An increasing number of animal studies now show that these starch-related components in winter squash have antioxidant, anti-inflammatory, as well as anti-diabetic and insulin-regulating properties. Seeds from winter squash make a great snack food, just like pumpkin seeds. If you scoop the pulp and seeds from inside the squash and separate out the seeds, you can place them in a single layer on a cookie sheet and lightly roast them at 160-170°F (about 75°C) in the oven for 15-20 minutes. By roasting them for a relatively short time at a low temperature you can help minimize damage to their healthy oils. Linoleic acid (the polyunsaturated omega-6 fatty acid) and oleic acid (the same monounsaturated fatty acid that is plentiful in olive oil) account for about 75% of the fat found in the seeds. Since summer squash (zucchini, cucumber…ect) have a high water content, they are not as nutrient-dense as the winter varieties. Summer squash still provide several nutritional benefits. They are low in calories and provide a decent amount of vitamin C, potassium, and carotenes. Studies have shown that juice made from summer squash is equal to juice made from pumpkins, leeks, and radishes in their ability to prevent cell mutations. Summer squash are especially beneficial during the summer months due to their higher water content. They protect against dehydration and the carotenes help to protect against the damaging effects of the sun. Squash is a vegetable that might be especially important for us to purchase organic. 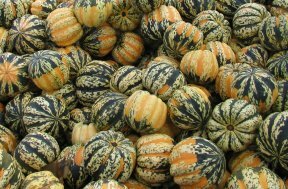 Recent agricultural trials have shown that winter squash can be an effective intercrop for use in remediation of contaminated soils. Polycyclic aromatic hydrocarbons (pahs), including pyrene, fluoranthene, chrysene, benzo(a)anthracene and benzo(a)pyrene are unwanted contaminants. Pahs are among the contaminants that can be effectively pulled up out of the soil by squash plants. When squash is planted as a food crop (as opposed to a non-food crop that is being planted between food crop seasons to help improve soil quality), the farmer’s goal is definitely not to transfer soil contaminants like pahs up into the food. But some of that transfer seems likely to happen, given the effectiveness of squash in mobilizing contaminants like pahs from the soil. For this reason, you may want to make a special point of purchasing certified organic squash. Soils used for the growing of in certified organic foods are far less likely to contain undesirable levels of contaminants like pahs. Easily found in supermarkets. 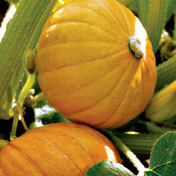 As its name suggests, this winter squash is small and round shaped like an acorn. One of my favorite baking squashes, it’s easy to slice into halves and fill with butter. A small acorn squash weighs from 1 to 3 pounds, and has sweet, slightly fibrous flesh. Its distinct ribs run the length of its hard, blackish-green or golden-yellow skin. In addition to the dark green acorn, there are now golden and multi-colored varieties. A relative of the buttercup squash that resembles a small pumpkin with orange skin. Bright orange flesh has a dry sweet taste. Peel it, cube the flesh, roast it, and serve like cut-up sweet potatoes. Has an extraordinarily long storage life. 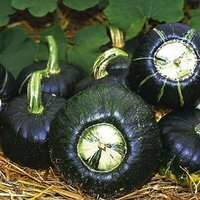 A hybrid semi-bush Buttercup/kabocha type dark green squash. Rich flavored flesh and high yields. Fruit size 6 inches with a weight of about 2 to 3 pounds. Flesh is yellow/orange meat that is stringless, dry, and sweet. 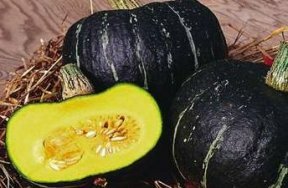 In shape and skin color, this winter squash is reminiscent of a banana. It grows up to two feet in length and about six inches in diameter. Its bright orange, finely-textured flesh is sweet. Banana squash is often available cut into smaller pieces. Available year-round – peak season lasts summer through early fall. Easily found in supermarkets. Beige colored and shaped like a vase or a bell. This is a more watery squash and tastes somewhat similar to sweet potatoes. It has a bulbous end and pale, creamy skin, with a choice, fine-textured, deep-orange flesh with a sweet, nutty flavor. Some people say it is like butterscotch. It weighs from 2 to 5 pounds. The oranger the color, the riper, drier, and sweeter the squash. 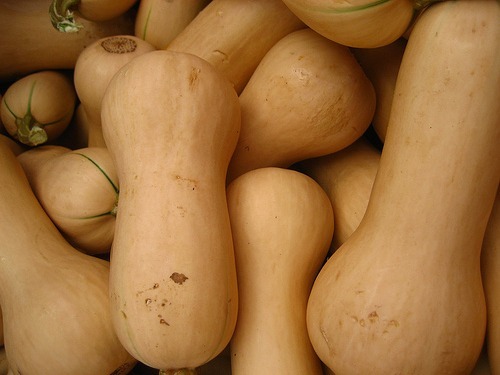 Butternut is a common squash used in making soup because it tends not to be stringy. Available year-round – peak season lasts from early fall through winter. Cream colored with orange spots or pale green with dark green spots in vertical stripes. Carnival Squash have hard, thick skins and only the flesh is eaten. It is sometimes labeled as a type of acorn squash. The delicious yellow meat is reminiscent of sweet potatoes and butternut squash and can be baked or steamed then combined with butter and fresh herbs. Also great in soups. Available year-round – is best late summer through early fall. Also called Peanut squash and Bohemian squash. This is one of the tastier winter squashes, with creamy pulp that tastes a bit like corn and sweet potatoes. Size may range from 5 to 10 inches in length. The squash can be baked or steamed The thin skin is also edible. The delicate squash is actually an heirloom variety, a fairly recent reentry into the culinary world. It was originally introduced by the Peter Henderson Company of New York City in 1894, and was popular through the 1920s. Then it fell into obscurity for about seventy-five years, possibly because of its thinner, more tender skin, which isn’t suited to transportation over thousands of miles and storage over months. French name is “Musquee de Provence.” The fruits are flattened like a cheese but each rib makes a deep convolution. The Fairytale Pumpkin is a very unique eating and ornamental pumpkin. It’s thick but tender, and the deep orange flesh is very flavored, sweet , thick, and firm. It is 115 to 125 day pumpkin and takes a long time to turn to it’s cheese color. The distinctive coach-like shape and warm russet color make it perfect for fall decorating too. This pumpkin is usually used for baking. Cut it into pieces and bake in the oven. 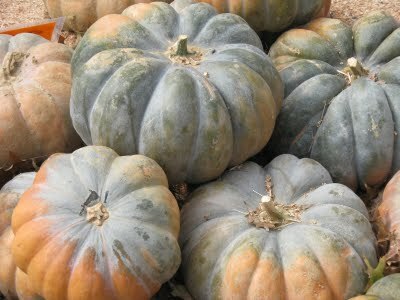 A variety of winter squash, which is sometimes referred to as an Oriental pumpkin that has the appearance of a small pumpkin in shape and color. It ranges in size from one to three pounds. 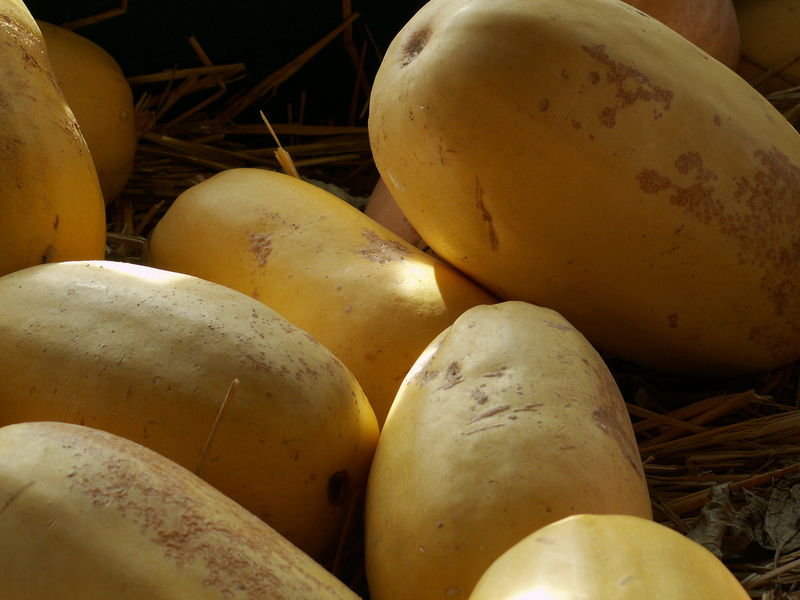 Golden nugget squashes are small, weighing on average about 1 pound. Both the skin and the flesh are orange. 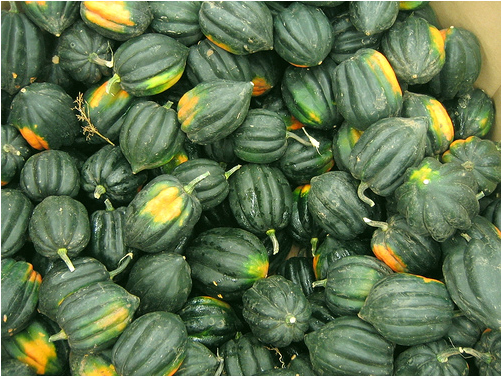 Gold Nugget Squash may be cooked whole or split lengthwise (removing seeds). Pierce whole squash in several places, and bake halved squash hollow side up. 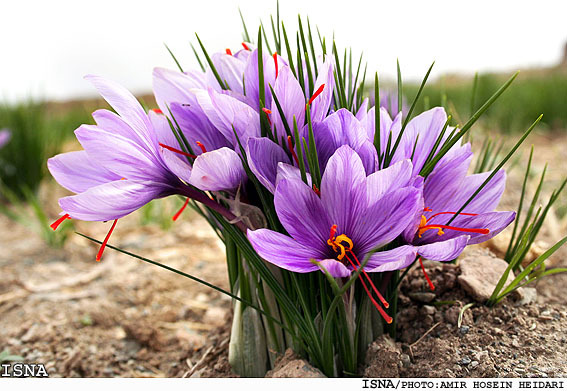 Available year-round – is best season is late summer through early winter. shes. These are very large and irregularly shaped, with a skin that is quite “warted” and irregular. They range from big to enormous, have a blue/gray skin, and taper at the ends. 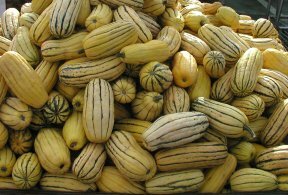 Like all winter squash, they have an inedible skin, large, fully developed seeds that must be scooped out, and a dense flesh. 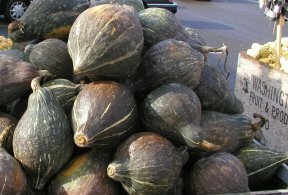 Hubbard squash is often sold in pieces because it can grow to very large sizes. The yellow flesh of these tends to be very moist and longer cooking times in the oven are needed. 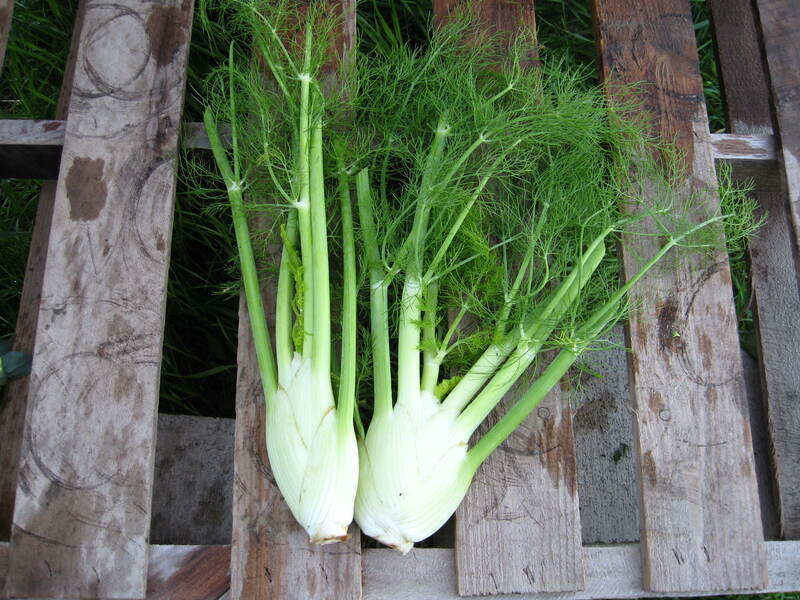 They are generally peeled and boiled, cut up and roasted, or cut small and steamed or sautéed. It’s perfect for pies. Hubbard squash, if in good condition initially, can be successfully stored 6 months at 50 to 55 degree F. With 70% relative humidity. Less rot will develop in the Hubbard squash if stems are completely removed before storage. Hubbard squash and other dark-green-skinned squashes should not be stored near apples, as the ethylene from apples may cause the skin to turn orange-yellow. Available year-round – peak season is early fall throughout winter. Kabocha is the generic Japanese word for squash, but refers most commonly to a squash of the buttercup type. This squash has a green, bluish-gray or a deep orange skin. The flesh is deep yellow. 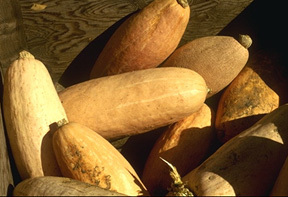 Kobocha Squash may be cooked whole or split lengthwise (removing seeds). It has a rich sweet flavor, and often dry and flaky when cooked. Use in any dish in which buttercup squash would work. A small, watermelon-shaped variety, ranges in size from 2 to 5 pounds or more. It has a golden-yellow, oval rind and a mild, nutlike flavor. The yellowiest Spaghetti squash will be the ripest and best to eat. Those that are nearly white are not very ripe. Although it may seem counterintuitive, larger spaghetti squash are more flavorful than smaller ones. When cooked, the flesh separates in strands that resemble spaghetti pasta. To prepare spaghetti squash, cut the gourd in half lengthwise and remove the seeds, then bake or boil it until tender. Or, wrap it in plastic wrap and microwave on high for 10 to 12 minutes. Once cooked, use a fork to rake out the “spaghetti-like” stringy flesh (all the way to the rind), and serve. Spaghetti Squash can be stored at room temperature for about a month. After cutting, wrap in plastic wrap and refrigerate up to 2 days. Spaghetti squash also freezes well. Available year-round – season early fall through winter. This small, mildly sweet-tasting squash resembles a miniature pumpkin with its top pushed in. It has cream-colored skin with green specks. Weighing only about 7 ounces, it has sweet and tender orange flesh and is a great size for stuffing and baking as individual servings. Sweet dumplings are tiny but great for roasting and presenting whole. Named for its shape. 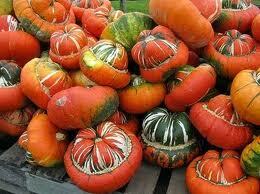 Turban Squash has colors that vary from bright orange, to green or white. It has golden-yellow flesh and its taste is reminiscent to hazelnut. Has a bulblike cap swelling from its blossom end, come in bizarre shapes with extravagant coloration that makes them popular as harvest ornamentals. It is popular for centerpieces, and its top can be sliced off so it can be hollowed and filled with soup. 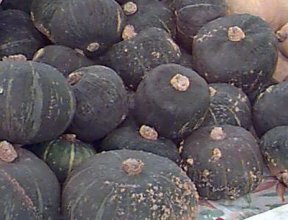 A larger variety of the buttercup squash, the turban has a bright orange-red rind. Its flesh and storage ability are comparable to the buttercup squash. Use in recipes that call or pie or sugar pumpkin. Available year-round – season is late summer through early fall. I woke up early this morning and realized, its been just about two months since I have posted any new recipes. My only excuse is its been a very busy December and January leaving little time to cook, let alone type. I did however create a few keepers over the holidays and will work on getting them up this week. So far my 2011 has gotten off to a nice start; now, the days are getting longer, sunshine appearing more often and yesterday I even noticed the tips of late Winter flowers peaking through. I’m really looking forward to putting away the soup pot, dusting off the BBQ and sharing my collection of Spring and Summer recipes! He classified sprouted seeds and baby greens as the most beneficial foods and recommended that they make up 25% of our daily food intake, calling them life-generating Bio-genic foods which he claimed offer the strongest support for cell regeneration. In our daily life, various factors transpire to create free radicals within our bodies. Free radicals are highly unstable oxygen molecules needing an electron to stabilise their entropy (chaotic state). By stealing electrons from healthy cells the causal effects of this are the breakdown of vital biological structures and the alteration of DNA and RNA (a process called per oxidation). Once this has occurred, the affected cell will only reproduce the altered version.These superfoods are a powerful source of antioxidants (minerals, vitamins and enzymes) which assist in protecting against this damage. A healthy body is alkaline (i.e not acidic).Bio-genic foods have an alkalising effect on the body. Raw foods contain oxygen and regular consumption of raw bio-genic foods with their abundant oxygen is valuable to health. Double Nobel Prize winner Dr Otto Warburg found growth of cancer cells were initiated by a lack of oxygen and these cells, along with viruses and bacteria, could not live in an alkaline and oxygen rich environment. Bio-genic foods are a good source of essential fatty acids (the average western diet is generally deficient in these) which play a major role in the immune system defences and are one of the highest food sources of fibre. When these superfoods are grown to the chlorophyll rich two leaf stage, it has been shown they have been effective in overcoming protein-deficiency anaemia. Some women have found that daily consumption of these superfoods has given relief from hot flushes and supported hormonal function. This biochemistry modifies the array of minerals in sprouts so that they are in a chelated form which is more easily assimilated in the body. It also denatures protein into the amino acid building blocks so that we can digest them in half the time of cooked foods.